Tarillo Vue has established an ongoing working relationship with Venture Construction out of Florida. 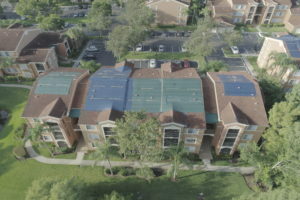 While we’re located in Dallas, we do an extensive amount of aerial photography work across Florida for various clients. Venture Construction works hard to help clients with both commercial and residential properties get claims processed quickly and perform repairs. 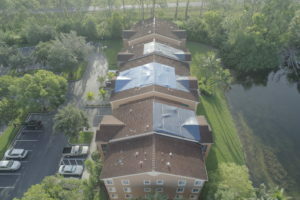 They had been exploring various ways they can efficiently and cost effectively document the conditions of roofs to help with documentation in processing Roof claims and showing completion of those projects — aerial inspections are a good way to do this. Many Condo associations in South Florida got hit pretty hard by hurricane Irma and Venture has been there every step of the way with helping to perform repairs and make sure the repairs are paid for properly by the insurance companies. Our roll in working with Venture moving forward is to deploy drone technology for better documentation for insurance claims of roof conditions prior to storms, documentation of preventative care taken to protect the property, and documenting the completion of projects. 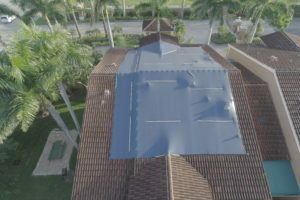 This project down in Naples was for 2 condo associations capturing images to document the black tarps that were installed on the damaged roofs. Images and video were captured on 9 buildings total and edited with a watermark that included the date captured, address, con name, and company logo. To learn more about how Tarillo Vue can help you deploy drones for a competitive advantage to better document property conditions for insurance claims, give us a call at (214) 842-6000 today.